The Panasonic TX-50AX802 heralds the inevitable evolution of 4K from esoteric telly tech into something entirely more mainstream. A relatively affordable price, accommodating 50-inch screen size, crowd-pleasing connected features and Freetime roll-back EPG, it's a premium panel for the rest of us. Of course, if you want more real estate, it's also available as the 58-inch Panasonic TX-58AX802 and 65-inch Panasonic TX-65AX802. 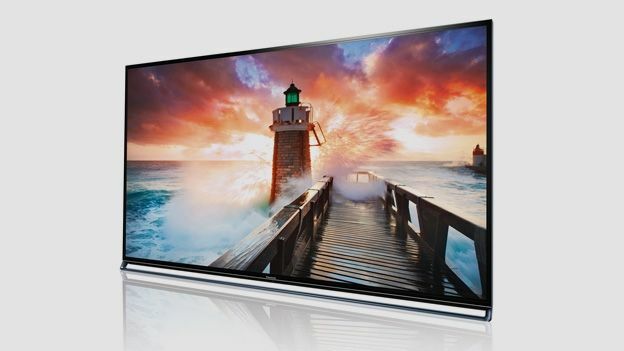 It's main high street rivals are the Sony KD-55X9005B and the Samsung UE55HU8500. Few Internet enabled screens are as well connected as the AX802. Joining Panasonic's customisable my Home Screen launcher this season is my Stream, a highly graphical curated programme recommendation engine, plus Freetime, the roll-back EPG first seen on Freesat set top boxes which has now matured into a Freeview-friendly TV guide. With Freetime there's no need to fire up individual catch-up apps, just scroll back to find the show you want using the reverse programme guide and select from there. Channel players (BBC iPlayer, ITV Player, 4OD, Demand5) boot automatically. Also new is the Info bar, used when the TV is in Standby. An integrated proximity heat sensor throws up time, weather information and messages whenever someone meanders nearby. Other connected niceties include network and USB media players, plus Skype, Netflix, Vimeo, Wukai.TV and Dailymotion apps. The AX802 may look slight, but this thin-bezel TV is in fact bewilderingly substantial, weighing in at 24kg. An ingenious counterweight pedestal block behind the screen gives the illusion that the TV is resting on nothing but its chrome frame. A built-in camera automatically pops up when required for Skyping or facial recognition duties. The TV comes with two remotes. The standard IR controller boasts a high-quality metallic finish and reassuring heft, while the Bluetooth Touch Pad controller has an integrated microphone for voice interaction. The TX-50AX802 redefines picture expectation when it comes to 50-inch LED flatscreens. Offering extreme contrast, rich colours and superb definition, it looks sensational with both Full HD and 4K UHD content. Motion handling is above average, provided you keep Intelligent Frame Creation processing on a tight leash. Not only do sport and movies look terrific, the set shines with games too. Bungie's Destiny Alpha on the PS4 is a riot of upscaled definition and kaleidoscopic colour. The set features a 2000Hz iteration of Panasonic's Local Dimming Pro technology, but full black does reveal some unevenness. Helpfully there's a Dimmer function, which preserves contrast and black level in the bars above and below a letterboxed movies. Unfortunately, while the TV sports an integrated HEVC decoder, it's not compatible with the Netflix 4K service. So to assess UHD performance we instead turned to Panasonic's own DMC-GH4 compact system camera, which records 4K at 24fps. The results looked gorgeous, with the TV delivering ravishing image quality. While the sound system built into the AX802 won't shake the roof, it does offer a forceful performance, thanks to a chunky rear facing 10w speaker and a couple of downward firing stereo helpers. With this slick 50-incher, Panasonic has begun a mainstream migration away from 1080p panels to 2160p for larger screens. This TV combines gorgeous images with a highly sophisticated Smart platform and the easy brilliance of Freetime catch-up. Even the omission of Netflix 4K isn't enough to dampen our enthusiasm.